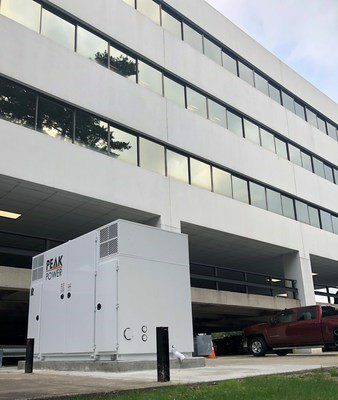 NEW YORK – Peak Power Inc., a leading energy services provider, announced today that it has successfully completed the installation of 375 kW / 940 kWh of battery energy storage with GHP Realty, a division of Houlihan-Parnes Realtors, LLC, at their headquarters at 4 West Red Oak Lane, White Plains, New York. This project was funded in part through an incentive from a Con Edison Energy Efficiency program. This project represents one of the largest energy storage installations in a commercial building in New York. It features Lockheed Martin’s Gridstar 2.0 energy storage technology, paired with Peak Power’s intelligent software platform, SynergyTM. The SynergyTM software optimizes the operation of distributed energy assets such as battery energy storage, electric vehicles, and solar. It forecasts moments of peak demand on the grid through the use of Big Data and Machine Learning, a form of Artificial Intelligence. This project also utilizes Peak Power’s Building Insight Platform (BIP) which uses internet embedded sensors within the building as part of a comprehensive energy management system. The energy storage system will generate significant long term savings and a reduction in greenhouse gas emissions from electricity use. It will also help reduce the need for power from Con Edison’s grid at times when the demand for electricity is high, which usually occurs on hot summer days. That will help Con Edison keep its service reliable for its 3.4 million customers in New York City and Westchester County. Energy storage systems are crucial for the future of the electrical grid to more effectively and efficiently balance variable generation with demand. GHP Office Realty is a division of Houlihan-Parnes Realtors, LLC, one of the leading owners, operators, and purchasers of suburban New York commercial real estate. GHP Office Realty has acquired, financed, redeveloped, leased, and managed more than 6,000,000 square feet of office space. Regionally, the partners own and manage buildings in Westchester and Rockland Counties, New York, in Fairfield County, Connecticut, in Bergen County and Princeton, New Jersey, and in Fort Worth, Texas. Peak Power is a technology services provider for the distributed energy resource market. Through their Peak SynergyTM controls platform, Peak Power is empowering building owners to achieve long-term savings from rising electricity bills, reach sustainability goals, and increase onsite resiliency, all while aiding utilities in addressing aging infrastructure and peak demand requirements. This announcement follows the recent partnership announcement between Peak Power and Alphabet Inc’s Sidewalk Labs to target increased sustainability in urban centers. For more information, please visit www.peakpowerenergy.com.